This past Sunday, I began a new, five-part series of Sunday morning messages at Ingleside entitled, Witness: Adventures in Acts. As we began, we noted that Acts 1:8 provides the overall outline and primary theme of the entire book. It’s really a verse that every Christ-follower should have memorized. Do you remember what it says? So, Acts 1-7 tells the story of the witness in Jerusalem. Acts 8-12 tells the story of the extension of the witness to all Judea and Samaria. And, Acts 13-28 narrates the expansion of the witness all the way to Rome. 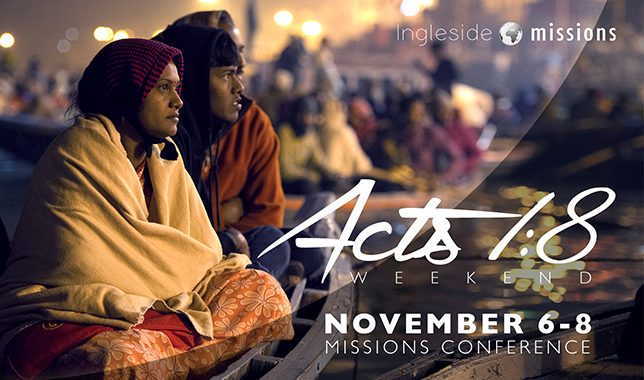 Acts is an account of faithful witness, the spread of the gospel, making disciples, and planting churches. Both numbers and stories are employed to illustrate the trajectory of growth. But Acts is much more than a fascinating historical account of the witness of the early church. It’s a reminder that the witness is to reach to the ends of the earth and that the witness is to continue until Jesus comes again. Acts is a call to every follower of Christ today to be part of the story. Every believer should be part of the witness. All who confess Jesus as Lord should be engaged in the mission. That’s why, every year, we have what we call an “Acts 1:8 Weekend” at Ingleside. We host missionaries from around the world in a Friday night dinner, a Saturday morning “World Adventure” for kids, Saturday night home groups, and in Sunday morning Bible study classes. So, I hope to see you at Ingleside this weekend. And, I hope you are reading through the book of Acts with me a chapter a day (today is Acts 4). Ask God to show you what your part in the witness should be. And then, by faith say “yes” to the adventure!